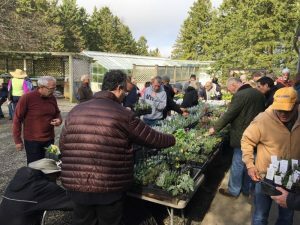 13th Annual Alpine Plant Sale and more! You are here: Home / News / 13th Annual Alpine Plant Sale and more! Please join us for Stonecrop Gardens’ 13th annual alpine plant sale with a special workshop on the aesthetics and cultivation of trough plantings by Lori Chips. Join Lori Chips, author of Hypertufa Containers, Creating and Planting an Alpine Trough Garden, (Timber Press, July 2018) and longtime alpines manager at Oliver Nurseries in Fairfield, CT. Lori will demonstrate composing miniature landscapes in trough plantings, selecting and placing an anchor feature, be it a shrub, iris, or rock, and incorporating other plants: buns, ground-covers, and cascaders. She’ll share her alpine favourites, techniques for successfully incorporating rocks in these designs, and trough maintenance. Other topics, depending on audience interest, might include creating a gorge or other level changes, or working with particular plants, plant groups, or growing conditions. Wrightman Alpines, New Brunswick, Canada – Grower and supplier of choice alpine plants and rock garden plants. Garden Vision Epimediums, Templeton, MA – Grower and supplier of Epimediums and other choice shade perennials. Broken Arrow, Hamden, CT – Growers of rare and unusual plants. Issima, Compton, RI – Collectors, propagators and growers that focus on the under-cultivated and garden-worthy plants, and specialize in unusual perennials. Jay’s Nursery, Watertown, CT – Grower of choice conifers and shrubs. 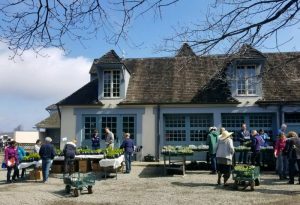 Edgewood, The Lonsdale Garden, Exton, PA – Grower and propagator of a wide variety of choice and rare woodland and alpine plants. Debra Pope, Auburn, MA – Creates unique, custom hypertufa troughs. Don Dembowski, Pelham, NY – Spring Ephemerals and Woodland Wildflowers. Bill Perron, Cortlandt Manor, NY – Offers a variety of Cyclamen species, Arisaema, and Hellebores. McCue Gardens, Wethersfield, CT – Grower of fine native plants and unique and rare perennials. Lori Adams Photo, Hopewell Junction, NY – Fine botanical art and greeting cards. “Kristen’s Creations” featuring Tillandsia & succulent designs.